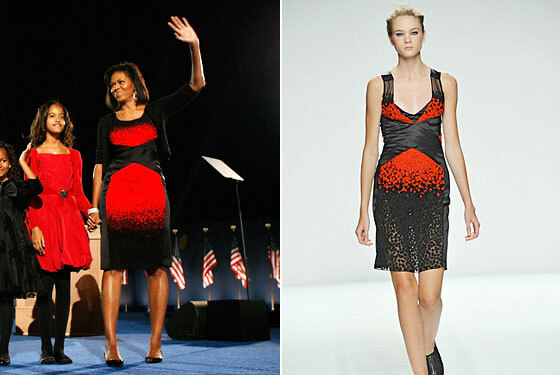 Editor's Note: In honor of the one year anniversary of Barack Obama's election, we thought it would be fitting to re-publish this defense of Michelle Obama's controversial election night dress. It originally ran on November 5th, 2008. Read designer Narciso Rodriguez's thoughts on the frock here. Good morning! Happy Wednesday! Happy Hangovers!, etc, et al. I know it's a good day because everyone's favorite candidate won and people were dancing in the streets like it was 1964 and you're probably nursing a hangover that for the first time in your life you're actually happy to have. So, congratulations! But I've got some bad news. There are some Debbie Downers out there that in spite of all that is good and in spite of all that is finally, truly, hopefully right in this world, have found something - gasp! - wrong with last night. PopCrunch gives it an "Eh. ", Half of Tumblr is calling for the head of Michelle Obama's stylist, and I am clearly prone to exaggeration. So, what's the big problem? Well, as a friend so eloquently put it: "It looked like someone puked spaghetti on it." I politely disagree. The dress, which is from Narciso Rodriguez's Spring 2009 collection and which, incidentally and according to NY Mag was "one of the most critically acclaimed of New York Fashion Week" is abso-effing-lutely stunning. At least NY Mag's fashion sense is still decidedly sane. The dress was utterly flattering with it's black criss-cross waist (Helpful Fashion Tip: Darker colors around your midsection give the nice illusion of a whittled waist, not that Michelle needs any help in that department!) and the elongating blend of red into black delightfully accentuated her statuesque stature. And mostly, it was interesting to look at. Which is something to be said with regards to the usual wallflower role to which First Ladies are usually relegated - a role to which I'd imagine Michelle Obama would not take kindly, dress or no dress. God, I love her. And so, that's all there really is to say. While I respect the voices of dissent (to each their own, to-may-toe, to-mah-toe, etc), I felt it was my civic duty to defend Michelle's dress - and defend it I have. The Style page has already devoted plenty of coverage to the sheer genius of Mrs. Obama's wardrobe (Thakoon, anybody?) so I won't blather on. Which brings us to the most important question of all: What do you think? PS. One last thing! Did you see how well they all matched? Swoon.